What could be more festive than using this 12 oz blue Glow cup when camping or at home. This blue 12oz glow cup is great for Saint Jean Baptise parties or as part of a blue themed party of your choice. Adults as much as children will enjoy the glow from this Blue Glow accessory. The glow cup has a duration of more than six hours and is for a single use only. You must strongly press the glow cup on the edge of a rigid surface to activate the glow liquid. When you hear a small crunch you must shake the cup to disperse the glow liquid. This cup is white plastic and holds a 12 oz beverage of your choice. 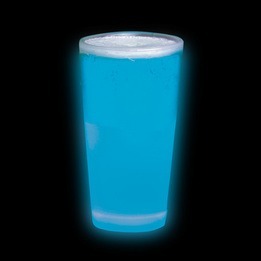 This 12 oz blue glow cup is not recommended for children under the age of 5 years old.